Dreams of a Humboldt Bay Trail connecting Eureka and Arcata got a major boost Tuesday, when the California Transportation Commission voted to allocate $2 million to the county for engineering design and environmental permitting for the trail’s southern portion. 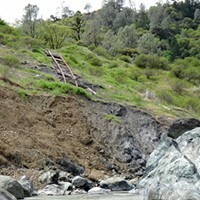 Humboldt County Deputy Public Works Director Hank Seemann said the funding is expected to come online in July, and represents a major step forward. “The momentum is really building,” said Seemann, who will be presenting an update on the project to Humboldt County Association of Governments March 27. In addition to the funding allocation, Seemann said his department is preparing to release a feasibility study analyzing where to place the trail from Target to Bracut early next month. Additionally, Seemann said the county will soon release a narrative document that defines the need and purpose of the project. “I would say there’s been a lot of really important developments in terms of agencies coordinating and in terms of having good technical information,” he said. While there’s clearly a momentum building, Seemann said, the project still has a long path ahead, noting that planners still haven’t settled on an alignment for the trail. 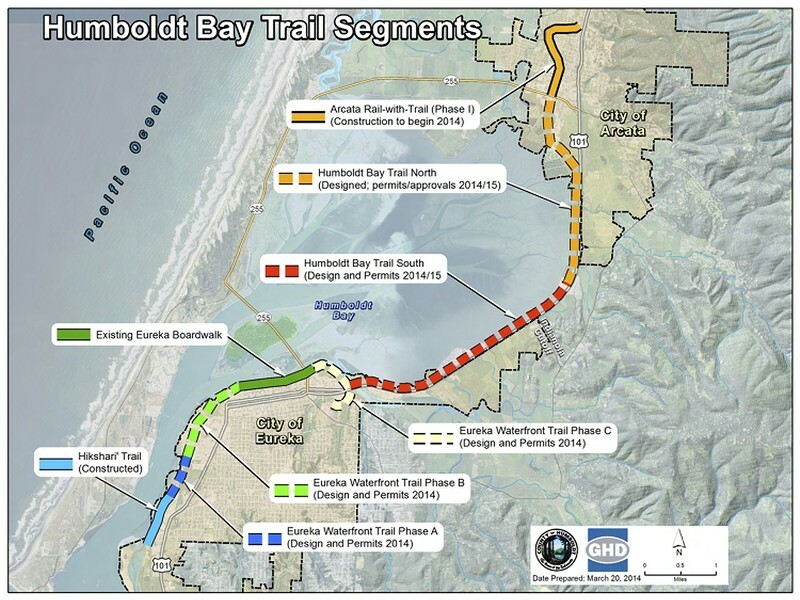 The Humboldt Bay Trail is a proposed Class I bikeway situated within the U.S. Highway 101 and railroad transportation corridors between the cities of Eureka and Arcata, along the east shoreline of Humboldt Bay. A Class I bikeway is a paved, two-directional trail separated from any street or highway. In addition to bicycle use, the trail would provide transportation, recreation, and coastal access opportunities for pedestrians, joggers, wheelchair users, skaters, and other non-motorized users. The City of Eureka has three phases of the Eureka Waterfront Trail currently in development. Phase A will extend from the existing Hikshari’ Trail to Del Norte Street, and Phase B will extend from Del Norte Street to C Street. Phase C will connect the existing Adorni Trail at Halvorsen Park to the existing Target Trail, then continue under the Highway 101 bridge at Eureka Slough to Tydd Street near Myrtletown. Phase C will connect with the Bay Trail South segment near the Target Trail and Eureka Slough. Funds for engineering and environmental permitting of the Bay Trail South segment will be available starting in July 2014. The engineering and permitting phase is expected to require at least two years due to the complexity of the project, proximity to sensitive resources, and constrained right-of-way. Funding for construction has not been secured. Potential funding sources for construction include: the state Active Transportation Program; Coastal Conservancy; the federal TIGER program; future State Transportation Improvement Program cycles; and private fundraising.